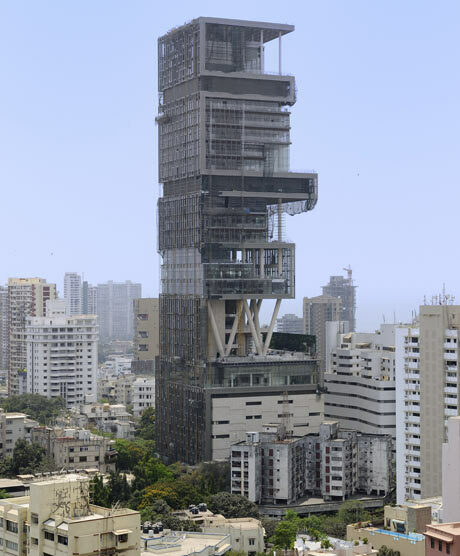 India’s richest man, Mukesh Ambani is scheduled to move into his new 27-story $1 billion home. Antilia is the name given to the colossal building located in South Mumba, India. Antillia’s first six floors are reportedly dedicated to parking with enough room to fit 160 cars for their family, their guests and employees. Some of the home’s key amenities include a health spa, multiple swimming pools, a 50 seat theatre, dancing studio and ballroom. The building also has three helipads and its own air traffic control. The decor is described as a mix of Asian contemporary and traditional. About a staff of 600 have been hired to maintain the home. In 2010, Mukesh Ambani placed #4 on the Forbes list of the Richest People In The World with an estimated net worth of $29 billion.